Hi folks, For today post i will show you how to crack and reset password at times when you forget it or when you want to gain access to a computer for which you do not know the password. 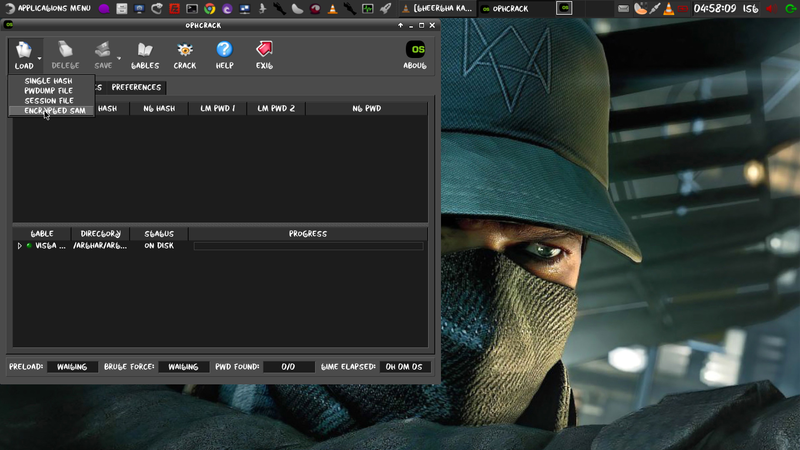 there are tons of tools available to crack password, but i am going to use most popular cracking tools that are defaultly available in kali linux. Download Kali Linux and burn the ISO to a CD/DVD or USB. Creating a bootable Kali Linux USB key in a Linux environment is easy. Once you’ve downloaded your Kali ISO file, you can use dd to copy it over to your USB stick as follows. Plug in your USB device to your Linux computer’s USB port. Verify the device path of your USB storage with dmesg. Insert the USB Live CD and Boot your PC. Make sure the Boot from USB is the first option in the Boot menu at BIOS. 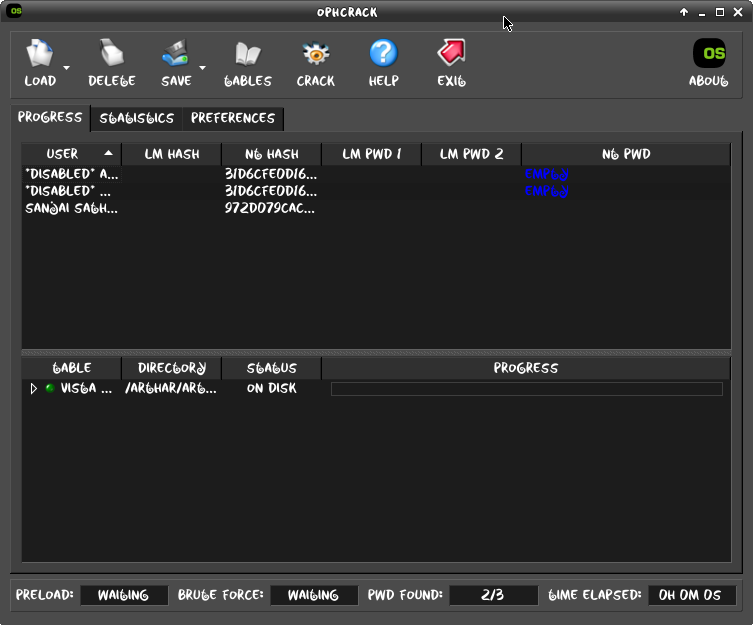 Ophcrack uses Rainbow Tables to crack NTLM and LM hashes into plain text, its a free Windows password cracker based on rainbow tables. It is a very efficient implementation of rainbow tables done by the inventors of the method. If you have a complex password it will take a lot longer than simple passwords, and with the free tables your password may never be cracked. Once the crack is done you will see the password in plain text, write it down and reboot the machine to login. If your password isn’t cracked, you can also log in as one of the other users with admin rights and then change your password from within Windows. 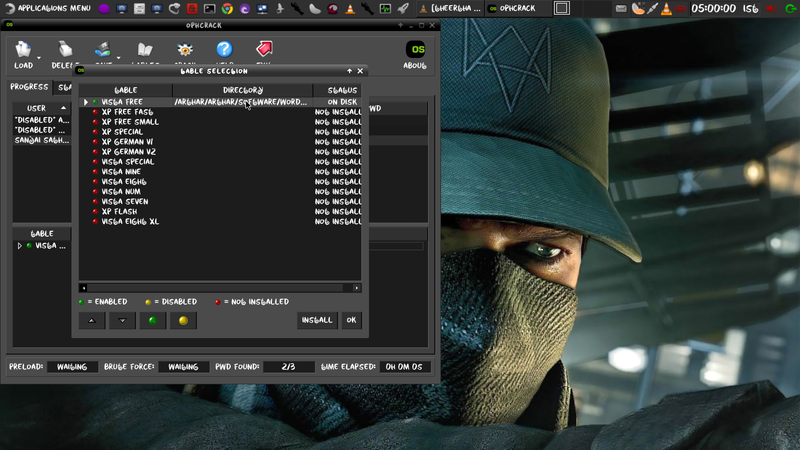 Here we can see the saved hashed now with the username and userid. That’s it. It’ll show the password , if you unsuccessfully go with free tables. I downloaded the xp free small and the Vista free tables. Once you have downloaded the tables you will need to unzip them in separate folders. I made a folder called “hash-tables” and then made 2 more folders within for each table to unzip to. Run the program and click on “Tables” button. Select the table you downloaded and click “Install”, navigate to the folder where you unzipped the table, select it and then click “ok.” You should see green lights next to the tables you installed. Navigate to the Windows password database file. Almost all versions of windows password is saved in SAM file. This file is usually located under /Windows/System32/config. On your system it may look something like this: /media/hda1/Windows/System32/config. Type command chntpw -l SAM and it will list out all the usernames that are contained on the Windows system. We now have the option of clearing the password, changing the password, or promoting the user to administrator. Changing the password does not always work on Windows 7,8 systems. it may works on XP system, so it is recommended to clear the password. Therefore you will be able to log in with a blank password. You can also promote the user to a local administrator as well. 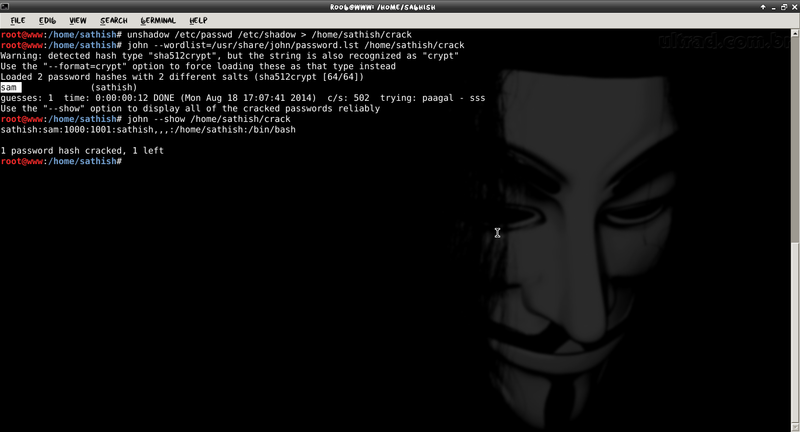 John the ripper is a popular dictionary based password cracking tool. It uses a wordlist full of passwords and then tries to crack a given password hash using each of the password from the wordlist. In other words its called brute force password cracking and is the most basic form of password cracking. It is also the most time and cpu consuming technique. More the passwords to try, more the time required. But still if you want to crack a password locally on your system then john is one of the good tools to try. John is in the top 10 security tools in Kali linux. The actual password hash is stored in /etc/shadow and this file is accessible on with root access to the machine. 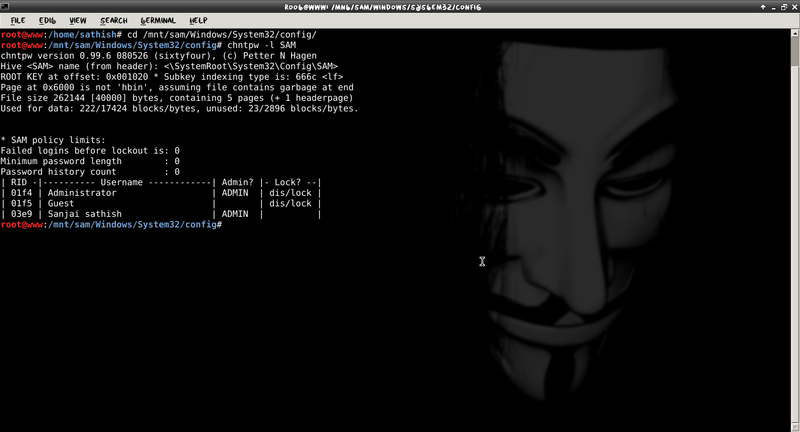 So try to get this file from your own linux system. Or first create a new user with a simple password. I will create a new user on my linux system named happy, with password chess. Now that our new user is already created its time to crack his password. The unshadow command will basically combine the data of /etc/passwd and /etc/shadow to create 1 file with username and password details. Usage is quite simple. 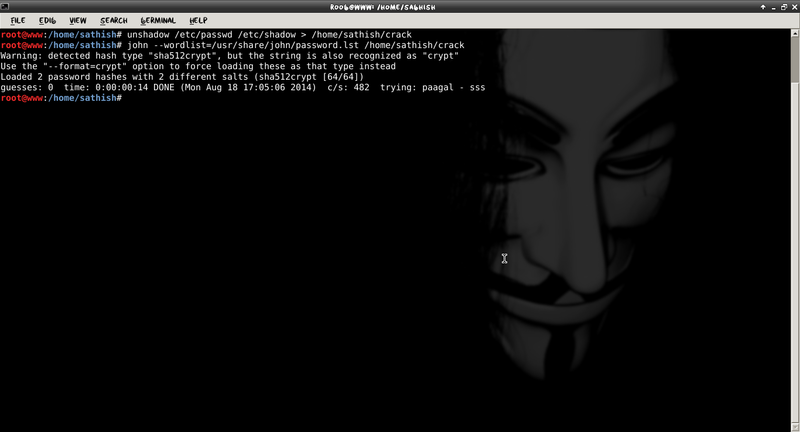 We redirected the output of unshadow command to a new file called crack. Now this new file shall be cracked by john. 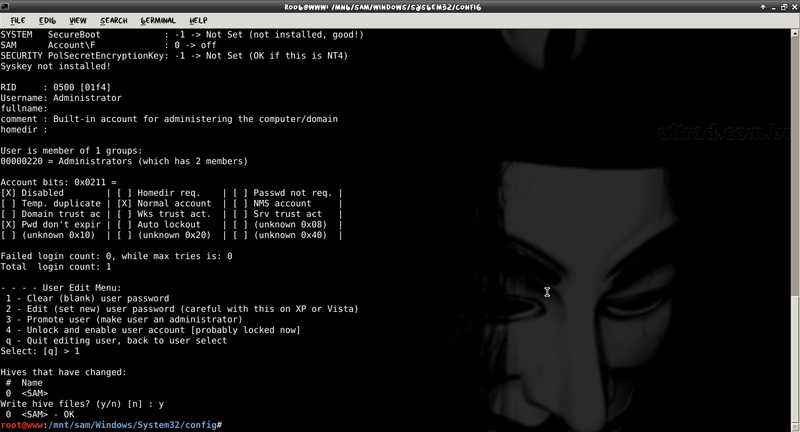 For the wordlist we shall be using the password list that comes with john on kali linux. It is located at the following path /usr/share/john/password.lst or you can use your own password lists too. 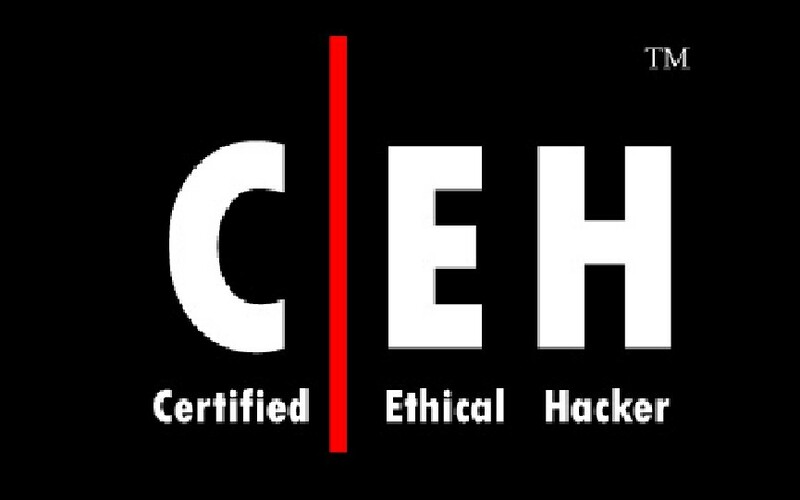 So in the above command john was able to crack the hash and get us the password “chess” for the user “happy”. Now john was able to crack, only because the password “chess” was present in the password list. If it were not there then john would have failed. Use the show option to list all the cracked passwords. Wait, Sanjay Satish? I don’t suppose that you live in the Puget Sound region? The rainbow tables are too expensive! Afterwards I have removed my forgotten Window password using PCUnlocker Live CD. besides noone uses rainbow tables anymore xD ust crack the hash using other methods dictionary+rules etc..
Every time i open system32 it says “no system file found” what do I do?